'La Lanterne', the James B. Clews estate designed by Horace Trumbauer c. 1929 in Brookville. Trumbauer copied 'La Lanterne' designed by Louis Le Vau in France almost to a tee (click HERE to see the French 'La Lanterne'). Clews was a senior partner at the brokerage firm of Henry Clews & Co. 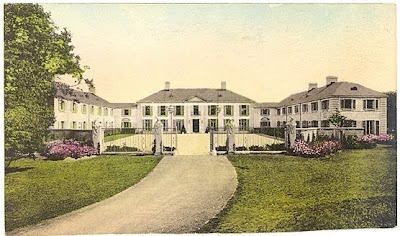 The central portion of the house was demolished c. 1952 and the two flanking wings were converted into private residences. Click HERE to see 'La Lanterne' on google earth. Interesting how the photograph makes the scale of the building look fairly domestic, when actually, it was overscaled and huge in the usual Trumbauer way---the man seemed unable to measure a foot in less than 18 inches. they always demolish the piece i'd keep but i suppose its more practical. the heck with that. is that house back and to the left an outbuilding or what? The Caroline Morse Ely is perfection. Does Ker Arvor still exist? Do you know its location? Anonymous: Ker Arvor is on the west side of Harrison Avenue, North of Castle Hill Avenue, almost directly across from the entrance of the Newport Country Club. Thanks! I know exactly which house that is and had wondered about that house - very lovely. I was in one of the flanking wings many years ago. 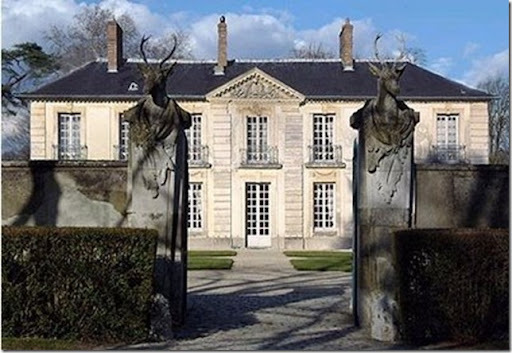 At the time, it was the house of one of the daughters of Thelma Chrysler Foy, and the fabulous Foy French furniture looked perfect against the Louis XV and Louis XVI boiserie that, I'm sure, was original to the house.